​The Mossman Elementary PTA invites you to join our 10th annual Fun Run as an event sponsor. This annual event raises money for enrichment programs and technology upgrades and promotes student fitness. Mossman Elementary’s 975 plus, students will collect pledges from friends and family members before running with their classmates at the Fun Run on October 26th. Our goal this year is to raise $15,000 through individual donations and business sponsorships. • Business Name on Mossman PTA website as a GREEN sponsor. • Business Name listed as a GREEN sponsor on PTA Facebook Page. • Business Name on the Mossman PTA website as an BRONZE sponsor. • Business Name listed as a BRONZE sponsor on PTA Facebook Page. • Business Name displayed on the FUN RUN Banner as BRONZE sponsor. • Proud Supporter of Mossman Elementary PTA 2018-2019 Decal for display. • Business Name on the Mossman PTA website as an SILVER sponsor. • Business Name listed as a SILVER sponsor on PTA Facebook Page. • Business Name displayed on the FUN RUN Banner as SILVER sponsor. • Business Name on the Mossman PTA website as an GOLD sponsor. • Business Name listed as a GOLD sponsor on PTA Facebook Page. • Business Name displayed on FUN RUN Banner as GOLD sponsor. • Business Name on the Mossman PTA website as an KALEIDOSCOPE sponsor. • Business Name listed as a KALEIDOSCOPE sponsor on PTA Facebook Page. • Business Name displayed on FUN RUN Banner as KALEIDOSCOPE sponsor. • LARGER Business name or logo on top half of FUN RUN t-shirt. • Featured Acknowledgment on the PTA Facebook Page and 4 x 8 Business Link with Business or Organization Photo. 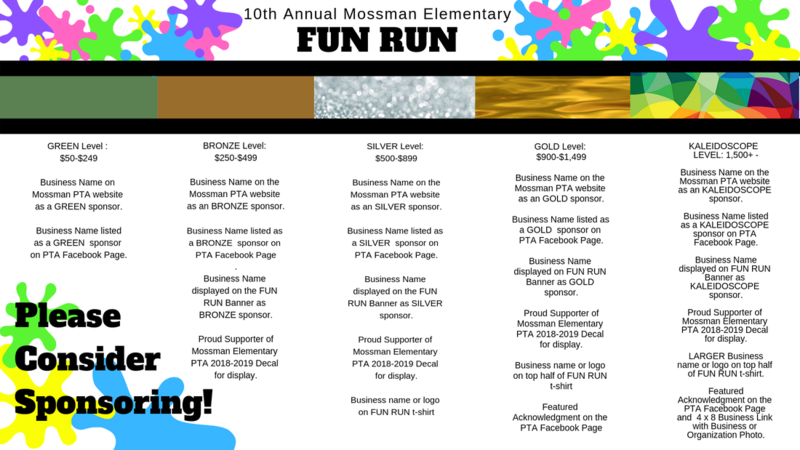 If you are able to contribute, please make your check payable to Mossman PTA and write “Fun Run” in the memo line. Checks can be mailed to Mossman Elementary, picked up, or hand delivered to a committee member. Contributions are tax deductible. A receipt with Tax ID can be provided upon request. If you would like additional information, please contact Jennifer Farley at 281-642-2878 or by email at . vp3waysmeans@mossmanpta.org . The deadline to receive names, and information for our printed sponsor list this year October 12th. Reminder! 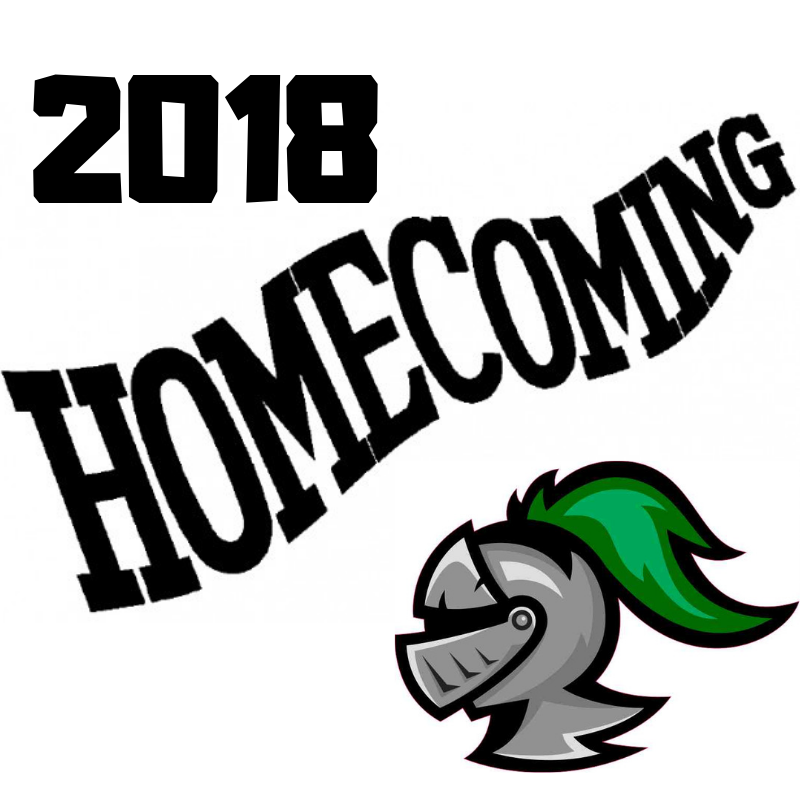 It is Homecoming Week! Let our little Knights get in on the fun and support our older students at the Education Village! 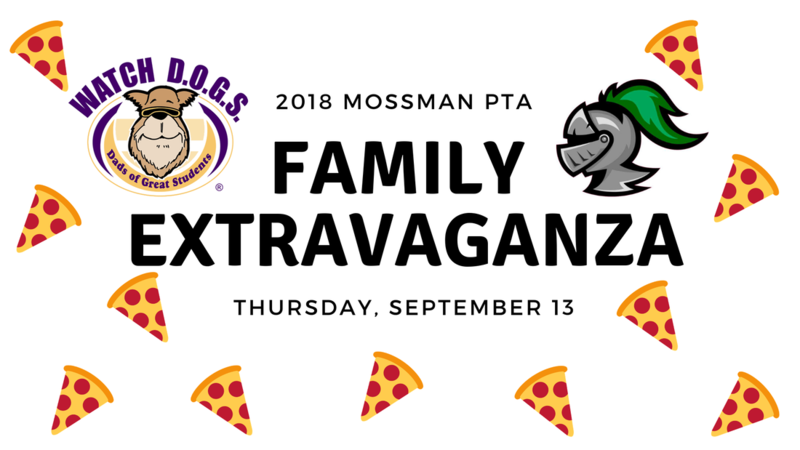 Please join the Mossman PTA for a fun and informative family evening on Thursday September 13th at 6:00 PM. We will present two events – our Annual Watch D.O.G.S. Pizza Night and our 1st General PTA Meeting of the 2018-2019 school year. Free pizza and drinks will be served to families at 6:00. At 6:15, we will have a presentation about our WATCH D.O.G.S.® (Dads Of Great Students) Program. WATCH D.O.G.S. is an innovative program being implemented across America that helps schools to be positively impacted by the committed involvement of fathers/father-figures in their student’s lives. Our goal is to have fathers/father-figures spend at least one day this year at Mossman to provide positive male role models for the students, demonstrating by their presence that education is important. During the pizza night, fathers/father-figures will be able to sign up to participate in the Watch D.O.G.S. program. Have you wondered who and what Mossman PTA is? 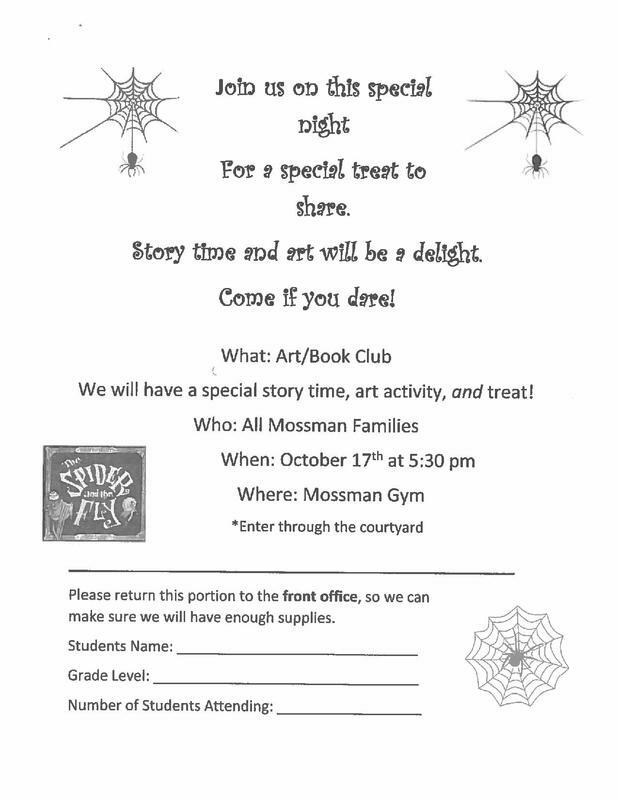 Here is your chance to come out and see all that the PTA does for Mossman. 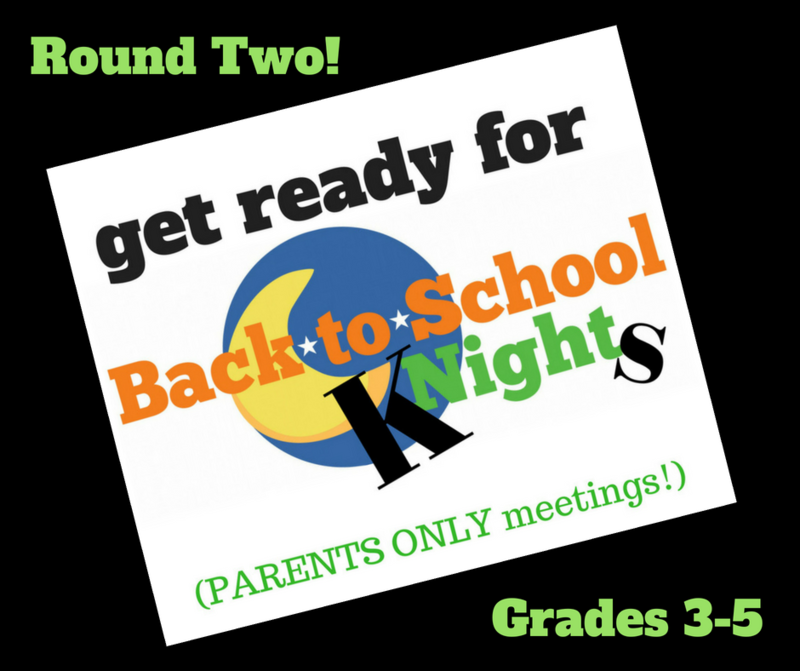 Mossman PTA would like to invite you to share in our first general meeting of the school year. PTA Membership and School Store spirit items will be available for purchase. In order to participate in this event, please RSVP online at HERE by Tuesday September 11th so we will have an accurate head count for the food and drinks. We hope to see you there! ​Grandparents may visit with students during lunch period!! Please make sure these special guests know where to park, how to enter the building and sign in, and what to expect when dining in our cafeteria! 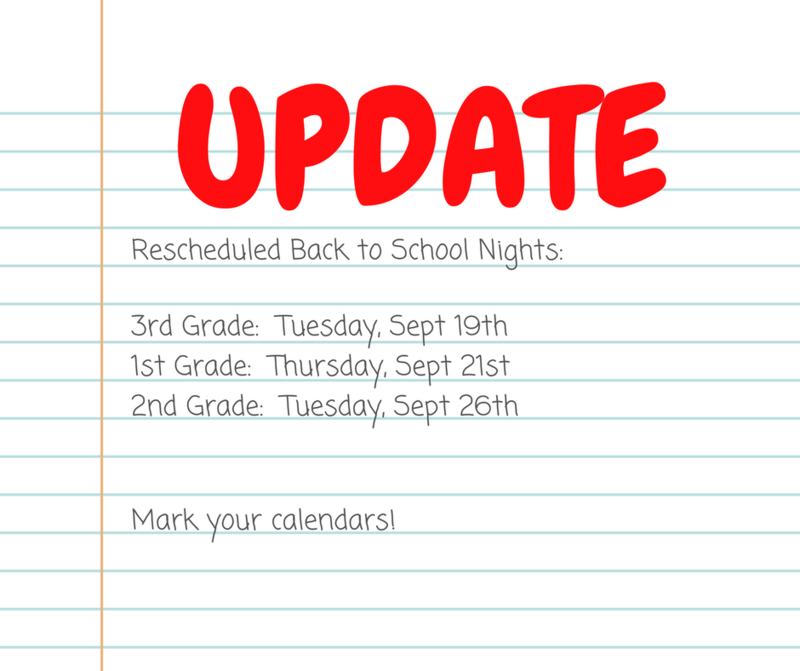 Tuesday, August 28th is Back to School Night for Grades 3-5. The meeting go from 5:30-6:45PM. These are PARENTS ONLY meetings. If your kids must join you, teachers ask that they sit quietly in the hall while the meetings are going on. Please email your homeroom teacher if you have any questions. See you then! Download and print this page and return it to school to secure your spot! Let's build on a great week with a Friday night movie! Please join Mossman PTA for The Lego Movie Friday, September 29th starting at 6:00PM in the Mossman Gym. We will have snacks. Just bring your kids and a blanket or camp chairs. Please RSVP either here OR on the facebook event on the Mossman PTA page. Thank you to everyone that filled out the forms on being on the Room Parent Teams and those who signed up as volunteers for the year. All the reports have been run and were turned over to the Room Parent Coordinator and our fearless Volunteer Wrangler and someone will be in contact with you soon! We thank everyone for their patience! 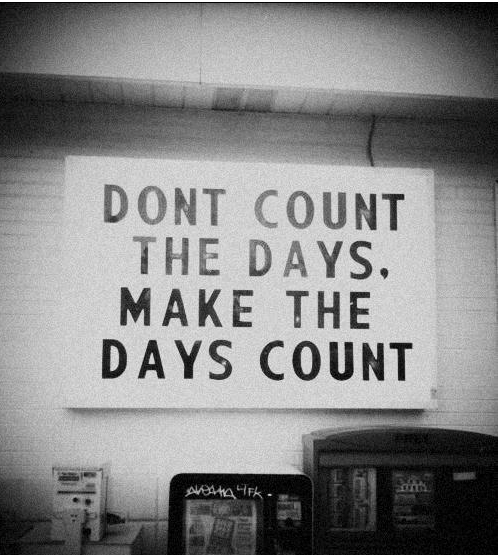 We are still trying to get our act together....but, it is time push forward and make this a great year! PARENTS ONLY 5:30pm Meet in your classrooms, and stop by the PTA tables to sign up for Watch DOGS Dad and to learn more about how you can get involved! Again, this is for PARENTS ONLY!